15 :: Gerrards Cross Golf Club is considered one of the most attractive courses in South Buckinghamshire. 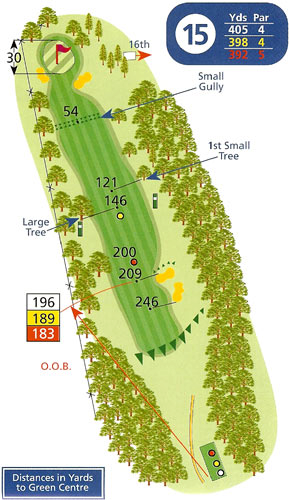 A good long straight par four lined with trees on both sides and two fairway bunkers on the right side which can catch short drives. Another bunker a little short of the green on the right claims pushed approach shots while a left greenside bunker waits for the pulled approach shot. The green is large and flat but there is little margin for error beyond it as rough and a fence mark the boundary of the course.